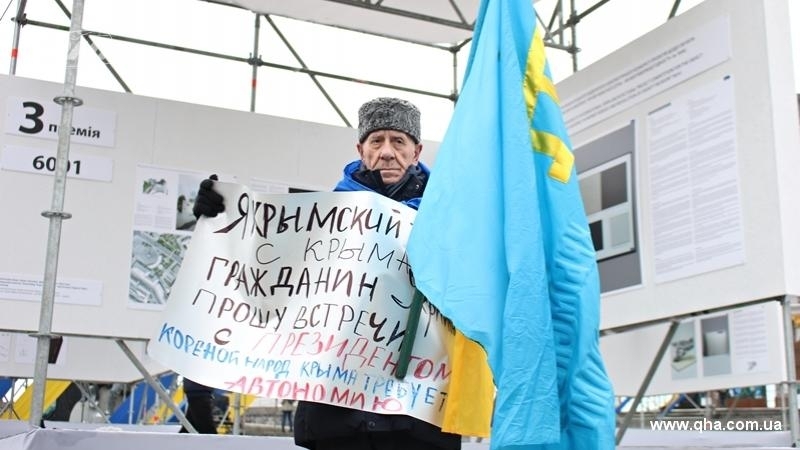 February 22, Crimean Tatar activist Server Karametov went on a one-person picket at the Independence Square in Kyiv. In his hands he held a poster: "I am a Crimean Tatar from Crimea, a citizen of Ukraine. I request the meeting with the President. Indigenous people of Crimea require autonomy! " “I am here today because for 4 years now President Poroshenko has promised that the Crimean Tatar people will have their own autonomy. And now 4 years have passed, he himself has not much time on the post, and we are still waiting for autonomy. I came from the Crimea, it's very bad to live there. Our compatriots, sons, all arrested, I was also arrested for a picket,” Server Karametov told QHA correspondent. Server Karametov was detained in the occupied Crimea on August 8, 2017 for a single picket at the "Supreme Court" of the Crimea. He was standing outside the building of the "court" with a placard saying: "Putin, our children are not terrorists! Stop accusing the Crimean Tatars! ". Then, under the Kremlin-controlled Crimean court arrested the 76-year-old activist for 10 days for allegedly "disobeying the police" and fined 10,000 rubles. “I then went to the picket, said that Putin must stop bullying our people. I was detained and imprisoned, fined 10,000 rubles and arrested for 10 days. I was kept in a stuffy cell. This is our life in the Crimea, that's why I came, for Poroshenko to start doing something. The MPs resist, and the people are suffering there,” the activist said. Reference: Russian security officials arrested Server Karametov for a one-person picket in support of Akhtem Chiygoz. Karametov was found guilty under part 1 of Article 20.2 of the Code of Administrative Offenses (violation of the procedure for organization or holding of a public event by the organizer). Earlier QHA reported about the release of the activist. 76-year-old activist suffering from Parkinson's disease was left by the law enforcement officers at the central bus station without money, and without warning anyone about it.